Dave Nichols and Andy Holmes of District Sports Page discuss the Washington Redskins 38-20 loss to the Green Bay Packers. It was the same story as Week 1 against the Eagles: the Skins got down quickly and big, and put up some yards and points in second half garbage time. For the second week in a row, the Washington Redskins failed to generate any offense or stop the opposing team in the first half. For the second week in a row, the opposition built an insurmountable lead and the Skins put up a bunch of yards and points in garbage time. The results this week? A 38-20 loss to the Green Bay Packers, a game not anywhere near as close as the score might indicate. If the Redskins were overwhelmed by the newness of the Eagles’ no-huddle zone read offense last week, they had no such excuses for the Packers more traditional schemes this week. The Packers built up a 24-0 halftime lead, and all that was left for both teams was to play their base offense and defense in the second half, much like a preseason exhibition. The Packers marched down the field on their opening drive much like the Eagles did, but the drive stalled at the 28-yard li ne after back-to-back sacks by Ryan Kerrigan. A Mason Crosby field goal made it 3-0, but the 14-play, 70-yard drive was just a harbinger of things to come. A three-and-out by the Skins offense and a shanked punt from Sav Rocca gave the Pack a short field, and they made the most of it, going 42 yards in four plays, the bulk of which came on a 35-yard touchdown pass from Aaron Rodgers to Randall Cobb. The second quarter offered no respite from the Packers onslaught. Rodgers hit Jordy Nelson with a 14-yard touchdown pass and followed with a 3-yard strike to Jermichael Finley for the 24-point halftime lead. Green Bay went right back to work in the third quarter. After John Potter missed on a 50-yard field goal attempt, the Pack went right down the field again, with Rodgers hitting Nelson for his second TD of the game, a 15-yard pass to the receiver’s outside shoulder that DeAngelo Hall had absolutely no play on. At that point, the Packers went into a very conservative, base defense, much like the Eagles did in Week 1, and Griffin and the offense started to make a few plays. Utilizing Alfred Morris and the short passing game, Griffin moved the Skins on an 8-play, 85-yard drive that culminated in a 6-yard touchdown from Griffin to Pierre Garcon. But the euphoria didn’t last long, as the Packers took the ensuing kickoff and needed just four plays to go 80 yards, the last 32 of which came on James Starks’ 32-yard touchdown run. Starks busted up the middle and went untouched for the score. The Redskins added some “dignity” points in the fourth quarter, as Griffin threw TD passes to Jordan Reed (3 yards, first NFL TD) and Santana Moss, a 9-yard strike that originally was ruled no good but overturned on replay. SKINS STATS: Griffin ended the day 26 of 40 for 320 yards and three touchdowns, but most of that was window dressing after the Packers retreated into their base defense in the second half. Garcon was the biggest beneficiary, making eight catches for 143 yards and a touchdown. Morris rushed for 107 yards on 13 carries. NOTES: Brandon Meriweather left that game with a concussion after hitting a Packers wide receiver with his helmet. Earlier in the game, he knocked Green Bay RB Eddie Lacy out of the game with a similar helmet-to-helmet hit. You hope Meriweather is okay and gets better quickly, but that type of play is obviously very dangerous and Meriweather can expect to get a big fine from the league for his reckless play. The Washington Redskins and Green Bay Packers, two teams thought to be top tier among their ranks in the NFC, both lost in Week 1. They enter Sunday’s showdown in Green Bay looking to avoid an almost calamitous 0-2 start. The game will be Washington’s first road test of the season and it will be far from a cakewalk. The Washington Redskins (0-1) enter play Sunday at Lambeau Field coming off a rather embarrassing 33-27 loss to the Philadelphia Eagles on Monday night. The Skins made the score close in the end with a strong second half performance, but they were overwhelmed right out of the gate by Chip Kelly’s zone-read no-huddle offense, and the Skins offense was moribund in the first half, turning the ball over three times. Robert Griffin III made his 2013 debut after an offseason filled with knee surgery, rehab and doubt. While he didn’t carry the ball as often as he did in 2012, nor did he really show the burst that makes him such a special weapon, he did show everyone he could be a pocket passer, completing 30 of his 49 passes for 329 yards with two touchdowns once he got his legs underneath him in the second half. It was, however, too little to late to salvage the win. This week against a rock solid Green Bay defense, look for Redskins offensive coordinator Kyle Shanahan to go back to basics. The Redskins offense is most effective when the run game is established early. This opens up the zone-read, as well as the play action pass. If Griffin is feeling more confident and is mobile, it will help open up the Skins offense. The defense will have another tough test this week, facing the Packers (0-1), led by former NFL MVP Aaron Rodgers. Rodgers is a textbook pocket passing quarterback (21 of 37 for 333 yards and two touchdowns Sunday against the 49ers) and Green Bay has plenty of offensive weapons for him. In the run game, rookie Eddie Lacy, a 5’11”, 230 rookie out of Alabama, will be leaned upon heavily to wear down the Redskins defenders. The targets in the passing game for Aaron Rodgers are plentiful and very talented. Jordy Nelson, Randall Cobb, and James Jones are big wide outs with great hands that have big play capability. Rodgers will also be targeting tight end Jermichael Findley, a prime third down target for Rodgers. Look for the Pack to run the ball first to set up the play action. The Redskins secondary will be tested heavily again this week. Redskins rookies Baccari Rambo, David Amerson and E.J. Biggers will be called upon to show improvement from their performances against the Eagles and come up with some big plays on Sunday to slow down the high powered Green Bay offense. The Skins hope veteran safety Brandon Meriweather will be available for the game after missing the Monday night game with a groin strain. This will be the home opener for the Packers as they lost their road opener to San Francisco 34-28. Expect the “Cheeseheads” to be a factor in historic Lambeau Field. Don’t turn the football over. In order to beat a high caliber offense like Green Bay, you must keep them off the field. Robert Griffin III has to make smart decisions when passing and Alfred Morris has got to hold on to football. Don’t take stupid penalties: Penalties absolutely killed the Redskins momentum Monday night against the Eagles. In order to be successful and have a legitimate shot to beat the Pack they will need to play smart. Put pressure on Aaron Rodgers: Rodgers was sacked twice on Sunday by San Francisco and ended up throwing for over 300 yards. If Brian Orakpo and Ryan Kerrigan can bring some pressure, it might be a different game for the Packers offensively. Stop the run: If the Packers can shut down Alfred Morris early, they will force RGIII to be a pocket passer. The Redskins offense is kick started by the run game. If the Packers can limit Morris and Griffin running, it’s not the same explosive offense. Put pressure on RGIII: The NFL saw Monday night RGIII didn’t seem as mobile as last season, and he certainly didn’t try to run on any designed plays. Some of that was getting down early, but he didn’t look comfortable in the pocket until well into the game. If the Packers put pressure on him early it might limit Griffin’s playmaking ability and reduce the Redskins offense to just the options they have in their playbook. Expose Skins Secondary: Aaron Rodgers will be playing against three rookies in the secondary on Sunday, so look for him to exploit every mistake they make. 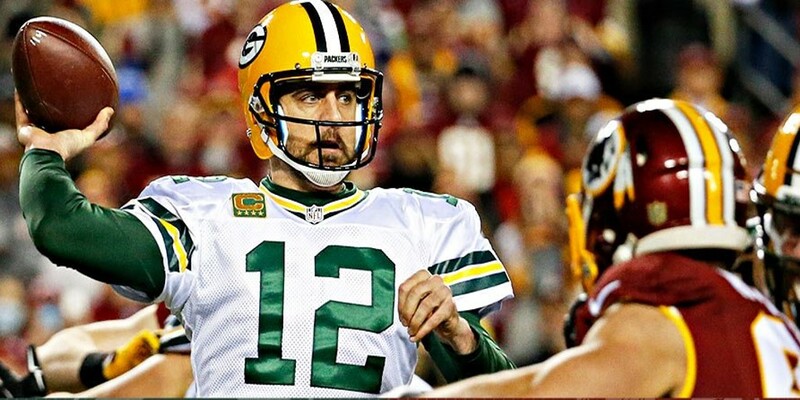 Rodgers is an elite QB and if he finds the openings, he will make them a positive for the Packers.